Posted on October 27, 2014 by Daniel Dexter. In the new ECE building, a specially designed lab space gives students an opportunity to develop as both engineers and musicians. The new music lab, located in 3024 ECE Building, is more than double the size of the previous space in Everitt Lab. Lippold Haken, an ECE lecturer, is excited that ECE 402, Electronic Music Synthesis, has two lab stations for students to work on instead of one. Now, the class is set up in a room that is acoustically isolated from the rest of the building. The upgrade creates an environment that is much more conducive to the music making process than what was previously available. 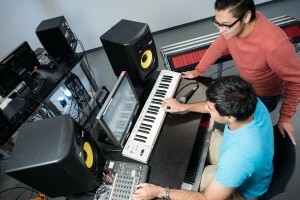 Students working in the Electronic Music Lab on the third floor of the ECE Building. “In Everitt Lab, we had a small room that we had retrofitted with acoustic carpet on the wall, and we could only put one station in there,” Haken said. Students now have the opportunity to schedule more convenient times in the lab. At Everitt, there was an issue of students having to schedule after midnight in order to secure lab time, but the new space has created much more availability for students. Lab time is a crucial aspect of the class because it gives students the opportunity to actually work with the sound equipment. All of the equipment found in the lab stations is also used in the movie and gaming industries. The devices in the music lab are meant to challenge students. Haken hopes students walk away from the class with greater understanding that engineering isn’t always about finding ways to make things easy. Creating music with a synthesizer should be a challenging process that requires a lot of time and effort, just like creating music with an acoustic instrument. Since joining the class, junior Molly Pace has enjoyed the opportunity to explore her musical interests, and said that the lab time has really helped her solidify its concepts. She decided to take the class after she saw Haken do a demonstration in ECE 110 of one of the most innovative items in the music lab: the Continuum Fingerboard. 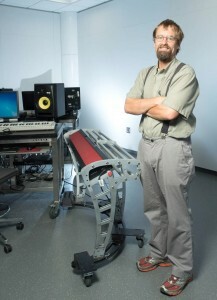 Lippold Haken in the new electronic music lab in the ECE Building. Haken invented the Continuum Fingerboard and said that many students are attracted to the class because of the opportunity to work with the instrument. While students won’t have enough time to master the instrument, they will get a chance to experiment with it. ECE 402 currently has about 60 students each semester, which makes it one of the largest technical classes of its type in the world. However, Haken would like to build a larger culture around the new music lab and develop students toward becoming even more passionate about the music they create. Posted on October 10, 2014 by Jonathan Damery. In some ways, completing the new ECE Building and populating a circuit board are rather alike. Both require the right components in the proper orientation. For the circuit board, these components include microprocessors, capacitors, micromachined sensors, and the like. For the new ECE building, they include the people who joined the department in the building campaign, offering financial support. 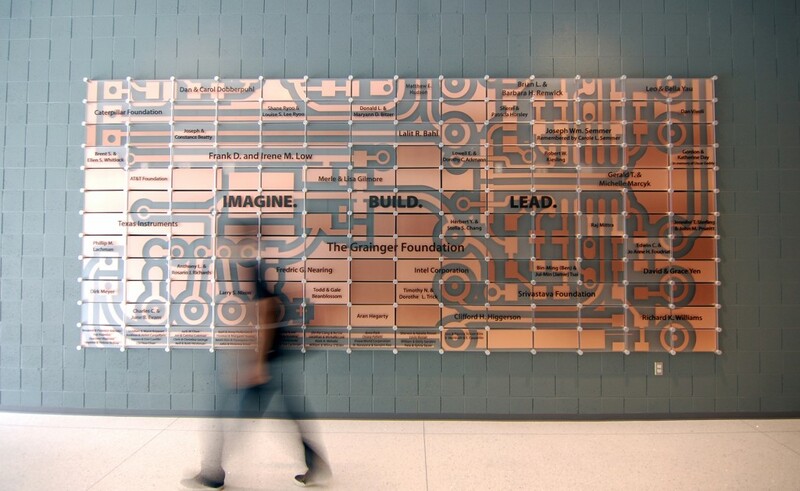 To recognize those donors in perpetuity, an art installation has been mounted between the lobby and the first-floor lecture halls. It resembles a wall-sized circuit board, measuring more than 18 feet long and 8 feet tall. The center features the motto, “Imagine. Built. 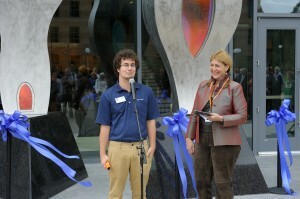 Lead,” thoughts that have echoed through the building campaign. Around it are the names of major supporters. The wall has been designed in two layers. The background is the enlarged circuit board, with copper film on rectangular tiles of acrylic glass. The outer layer, elevated on aluminum standoffs, uses congruent rectangles, also in clear acrylic, which offer a clear view of the circuit pattern beneath. Interspersed within these are frosted rectangles with the names of the donors written in raised bronze lettering. 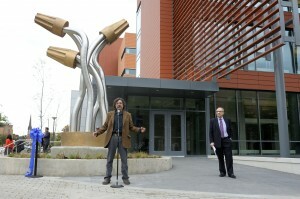 The cost for the building, including furnishings and lab equipment, amounts to $95 million. Half of the funding came from the State of Illinois, while the other half has come from individual and corporate supporters. Already, the building is proving to be an academic and social hub for students, with new features ranging from a host of instructional labs lab to ample collaboration spaces. The copper on the wall was fabricated using a die-cutter, which punches out the pieces using a custom-made blade, rather like an automated, super-sized cookie cutter. The pattern is based on a section of an actual circuit board designed by Skot Wiedmann, an instrument and measurement technician in ECE’s Electronics Services Shop. He used the board in an audio processing unit for electronic music, which he designed as a graduate student. According to Hearn, this donor recognition design may be the first of its kind. Neither he nor Christie had seen a wall-sized circuit board like this, and they were particularly pleased with the idea of using copper in the design. Not only is the building a vanguard accomplishment, but even this donor recognition wall is an innovation. “Illinois always likes to be the first,” Hearn said. It’s not too late to donate to the Building Campaign for ECE ILLINOIS. For more information, please contact Steve George at steveg@illinois.edu or (217) 244-8023.